"Music Behind" Harold Town 1958 || David Ben performs. Photo by David Linsell. So begins another round of program notes, this time for our upcoming production at Soulpepper called Hocus Pocus. These notes (my new blog series #HocusPost) are like an exhibition catalogue, providing commentary on the creative process and context for the work to be presented this December. Hopefully, they will also capture how my understanding of magic—sleight-of-hand in particular—has evolved over the past forty years. As I now understand it, magic has much more in common with music and visual art than it does with work dependent on dialogue such as drama or storytelling. Sure, I love a good story, just as much as the next person, and the new show will have one or two, but really magic, particularly sleight-of-hand, is based on movement and the orchestration of visual imagery. 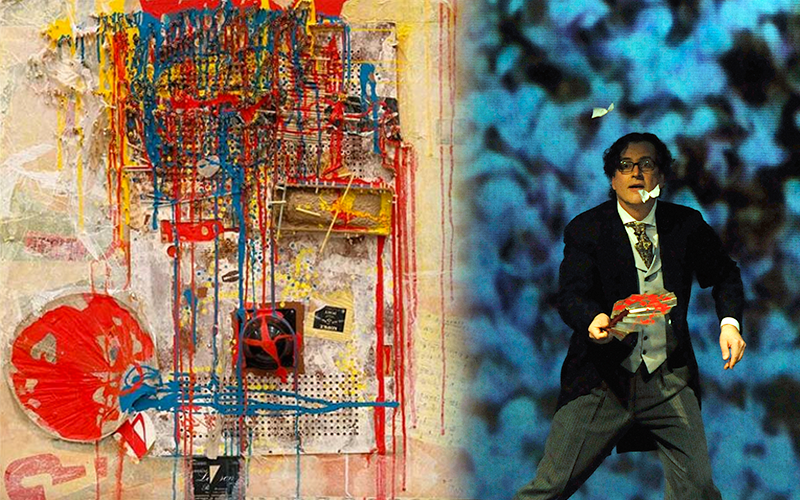 Each trick—or as I prefer to call them, piece—is a collage of mixed media combining movement, illusion, colour, sound, text, video and human interaction in a three-dimensional space that happens to be in a theatre. Unlike most magicians, my primary goal is not to fool the audience, although that may be a by-product of the visceral experience. Rather, my goal is simply to engage the mind and the eye with ideas that have the potential to transform, that is, to get each person - young and old - to look at the world in new ways. These pieces, really fragments of my imagination, also become yours.